Parsley is traditionally a symbol of great strength, It was believed to have sprung from the blood of Archemorous, a Greek hero and the forerunner of death. Parsley attracts some wildlife. Some swallowtail butterflies use parsley as a host plant for their larvae; their caterpillars are black and green striped with yellow dots, and will feed on parsley for two weeks before turning into butterflies. Bees and other nectar-feeding insects visit the flowers. Seed eaters such as the goldfinch feed on the seeds. Culinary uses:Parsley is widely used in Middle Eastern, European, and American cooking. 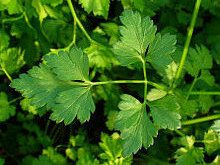 Curly leaf parsley is often used as a garnish. In modern cooking, parsley is used for its leaf in much the same way as coriander, although parsley is perceived to have a milder taste. In central and eastern Europe and in western Asia, many dishes are served with fresh green chopped parsley sprinkled on top. In southern and central Europe, parsley is part of bouquet garni, a bundle of fresh herbs used as an ingredient in stocks, soups, and sauces. Freshly chopped green parsley is used as a topping for soups like chicken soup, green salads or salads like Salade Olivier, on open sandwiches with cold cuts or pâtés. Parsley is a key ingredient in several western Asian salads. Parsley tea may be used as an enema. It is often used as an emmenagogue. Parsley also appears to increase diuresis by inhibiting the Na+/K+-ATPase pump in the kidney, thereby enhancing sodium and water excretion while increasing potassium re absorption. It is also valued as an aquaretic. Rich in vitamins A, B and C, and containing iron and calcium, parsley really is valuable body food. 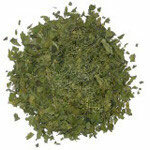 It helps prevent the growth of infection, aids digestion, and dispels bad breath. Parsley water may even fade freckles.